Eddie was one of the over 2,000 survivors of Pearl Harbor that are still left in the country. LAKE WORTH, Fla. - Seventy-six years ago on Thursday, Japanese fighter planes attacked Pearl Harbor, killing more than 2,400 Americans. But thousands more survived, including one South Florida man who was actually laid to rest on the very day he almost died all those years ago. WPTV was there at the South Florida National Cemetery as family and friends said goodbye to "Pearl Harbor Eddie" as he was known, a fitting service for Pearl Harbor Remembrance Day. Edward Hammond died in September at 93-years-old. 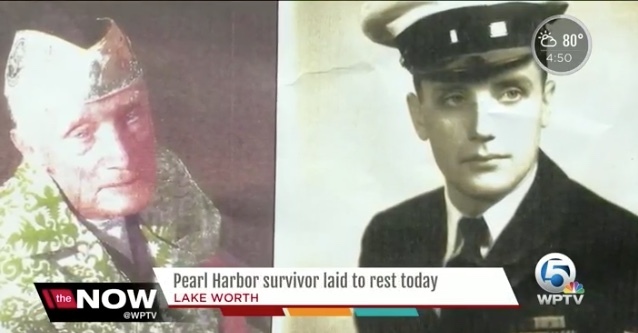 He was the last known Pearl Harbor survivor in the South Florida area. He was just 17 when he served in the U.S. Navy as a chief machinist mate, stationed at the United States Naval base in Pearl Harbor, Hawaii.